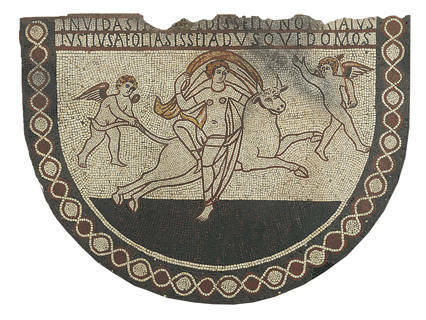 Of all the Roman remains uncovered over the years, there are more intact examples of mosaics than any other construction. It was mainly the walls and roofs of buildings that fell through decay and neglect. So the floors and foundations have remained largely intact to this day. 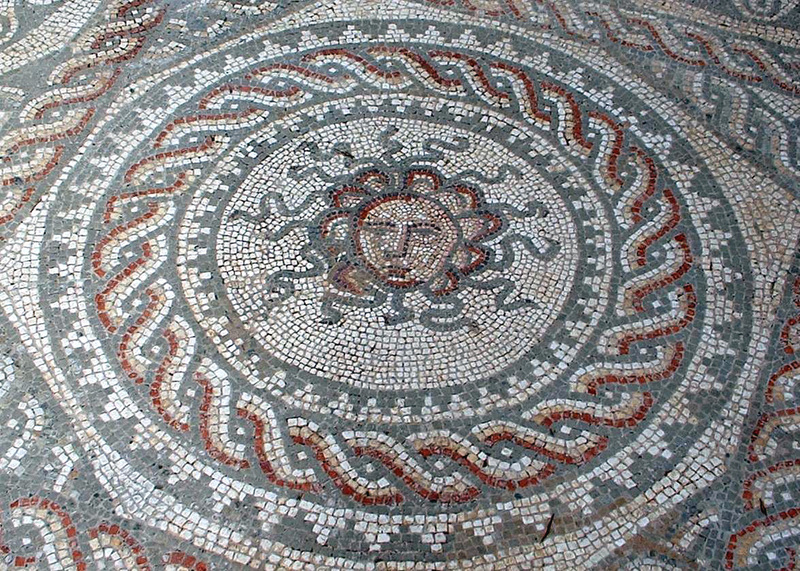 This helps archaeologists as the mosaics were not just random pictures that decorated a room, they were fundamentally a message to any visitor about the family or occupant of the building, rather than just being the carpets of Roman times. Only the wealthy villa owners could afford such an extravagance as a personalised design, so they were also used to make a statement about the occupants and their standing in society. 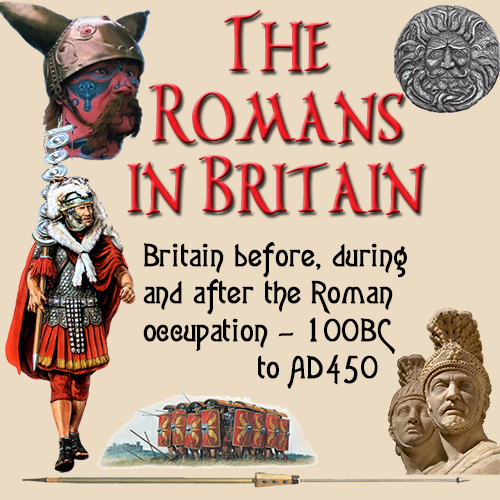 T he mosaics of Roman times were often bought 'off the shelf' with many standard designs being available. In larger towns, there were shops that had patterns in books very much in the same way that wallpaper is presented today. 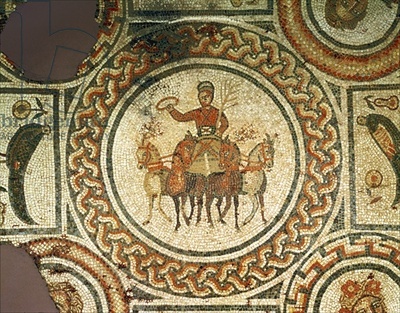 The mosaic may depict a scene from history, be a celebration of the emperor, or show the family as a group. 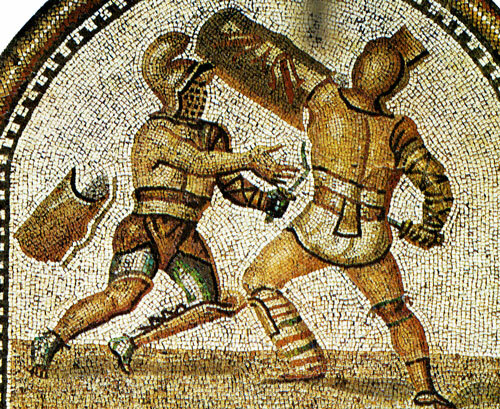 Whatever their purpose, mosaics were meant to be studied and talked about in great depth. 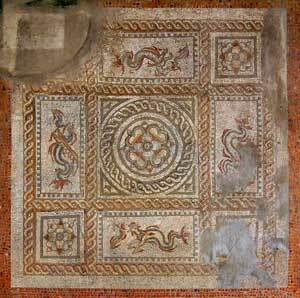 The mosaic was usually placed in the main room in the house, where guests were most likely to see and comment on it. First the mosaic would be drawn out roughly and many different combinations of content, style and design considered. This was often a long process as it was such an expensive and important part of the house, everything about it had to be to the customers liking. Once the design had been finalised, the artist would make a full scale colour drawing of the mosaic and it would be passed to the chosen craftsman to make the design into the finished product. Although the design had been agreed by now, it was mostly the case that it would have to be altered many times during it's construction before it was deemed to be acceptable. Pieces of discarded and broken pottery. Clay artifacts that had burst whilst being fired in the furnace due to air pockets in the material.. These were used to make the various shades of colour that would be used in the mosaic. 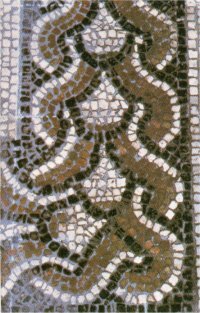 If the mosaic was geometric in that it consisted of patterns that were repeated throughout the design, panels were made and transported to the site and the mosaic built in sections. However, for the more intricate parts, the craftsman and his team would lay each piece by hand in it's allotted place. The first stage in actually building the mosaic was to prepare the surface. 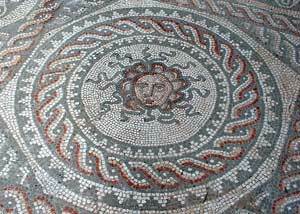 Mosaics were meant to last for many years, and also resist the possibility of subsidence ruining the finished product. The first task was to dig a hole the size of the finished mosaic and lay a base of rubble, ensuring it was compacted down and made level. This layer would then be covered in cement to a depth just below the level of the floor. Just before this hardened, the design would be drawn out using a sharp tool or painted on the surface if the cement had hardened faster than had been expected. The next part of the process was to spread a mixture of limestone and water over the cement. The apprentices would lay any prefabricated panels, and once they had shown their competence, they were allowed to work on any single pieces that made up the border. The work was tedious and exacting and required great patience and attention to detail A mosaic that covered an area of 15ft (4.57m) x 9ft (2.75m) contained about 120,000 pieces. It was a common trait of many mosaic artists to sign their work in some way as an advertisement. There was no actual signature placed in a mosaic, instead they would place an emblem or pattern in the mosaic that was their mark. Thereby indicating who was the creator of the work. 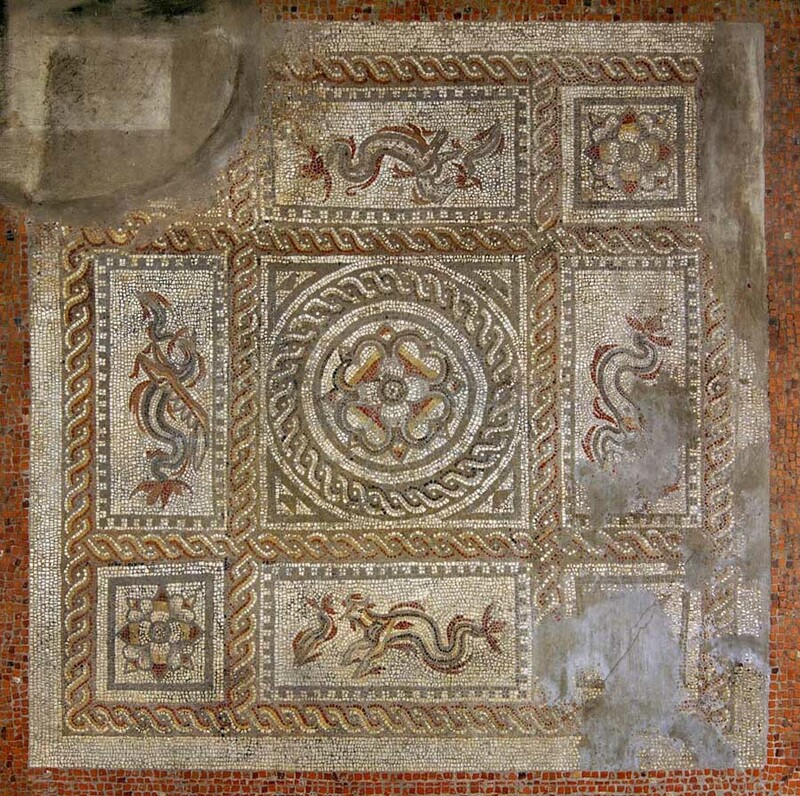 In the Fishbourne Villa mosaic, there is an image of a bird within the pattern, which is generally accepted as a trade mark or signature placed there to advertise the craftsman's art. 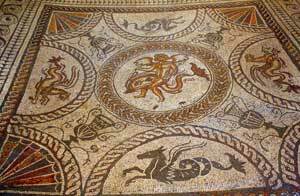 This was used to great effect and one such craftsman in Cirencester is known to had laid at least 50 mosaics in the surrounding area. Mistakes did happen when building mosaics. In symmetrical patterns, the most common mistake was using slightly different coloured tiles within the pattern where they were meant to be matching. 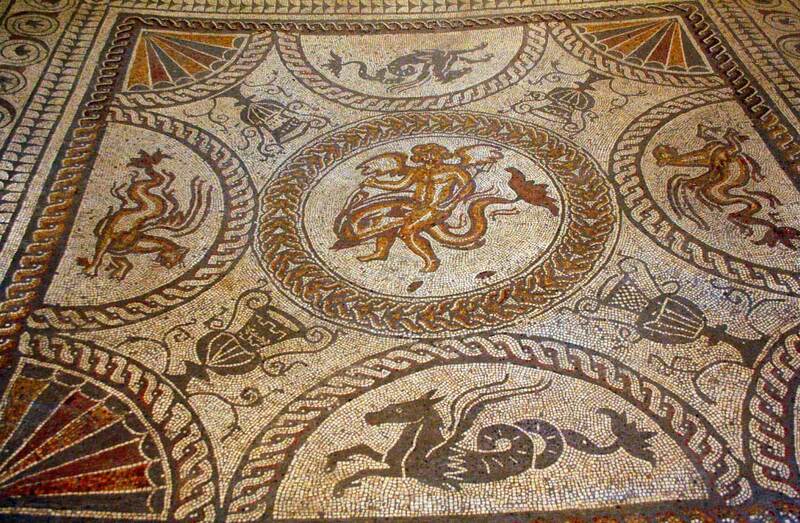 In the Newton St. Low Villa in Avon, England there is a mosaic depicting Orpheus. There is a glaring mistake in this work as one of the panels has been laid incorrectly and the pattern does not match the surrounding panels. Did you notice something peculiar? One thing that you will have noticed in the photos reproduced here, is that many of them have a dark mark in one area. This is not a flaw, or irregular colouring of the tiles. These patches are where the Romans had a fire in a brazier like container. Over a period of time, this caused the mosaic to become sullied. It seems strange that with such an expensive, intricate and important part of the house, the Romans should allow it to become damaged so readily.